Define issues and solve problems faster by characterizing your device, system or signal more completely and rapidly than previously possible with swept spectrum analyzers. Tektronix RSA2200A Series Real-Time Spectrum Analyzers capture many signals not viewable on swept spectrum analyzers by seamlessly capturing and storing a span of RF frequencies all at one time. 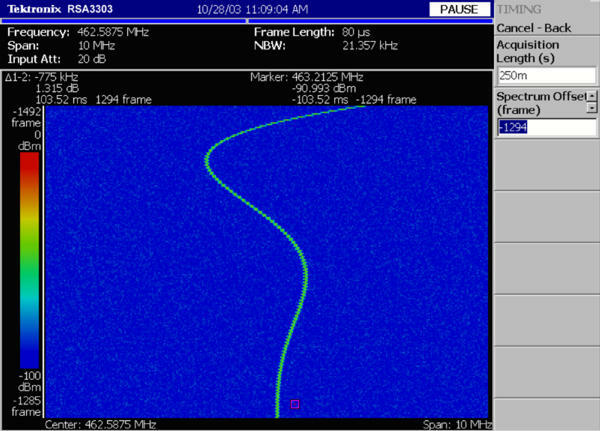 Once a signal is captured it can be viewed simultaneously and analyzed in time-correlated frequency, time and modulation domains. RSA Series instruments include not only Real-Time Spectrum Analyzer fast-signal capture, internal memory and modulation analysis, but also functionality and operation of a swept spectrum analyzer for looking at very wide spans, all in an integrated, transportable package. Marker Frequency Readout Accuracy - ± (RE*1 × MF*2 + 0.001 × Span + RFM*3 ) Hz. Accuracy: RE*1 × CF*4 + RFM*3. Resolution Setting = 1 mHz to 1 MHz. At 7 GHz ±14.01 kHz. Carrier Power >–40 dbfs*5 (typical). *5 dB relative to full screen reference. 50 Hz to 20 MHz, (Stop Frequency <20 MHz, Opt. 05). Span =0 Hz (Simultaneous with 50 Hz to 10 MHz Span in second analysis window). Resolution - < 0.2% of Span (Span =100 Hz to 10 MHz RSA2203A and RSA2208A). Accuracy - ±0.1% of Span. Number of samples per frame - 64 to 8192 (65536 samples/frame, extended resolution). RSA2203A and RSA2208A – 10 Hzp-p; 2 Hzp-p (Opt. 10). IQ Data Pairs: 1024 to 512000; Power vs. Time: 1 to 512000. RSA2203A and RSA2208A – Free run, single, external, IF level (10 MHz BW). RSA2203A, RSA2208A – ±0 .2 V (CF ≥20 MHz); ±5 V DC – 20 MHz (Opt. 05). Other Input-related Spurious - > 30 kHz offset – 70 dBc (Span = 2 MHz, Ref Level = 0 dBm, RBW=50 kHz, Signal Level = –5 dBm, any center frequency). Input Attenuation Switching Uncertainty (at 50 MHz) - < 0.5 dB for all values of attenuation. RSA2203A and RSA2208A: 512 kSamples. RSA2203A and RSA2208A: 10 MHz (RF); 20 MHz, DC – 20 MHz (Baseband (Opt.05)). RSA2203A and RSA2208A: 1 to 500 . Maximum A/D Sampling Rate and Resolution - 51.2 MS/s, 14 bits. 38/s, (SA Mode, 2 MHz span, 128 point FFT). 35/s, (SA Mode, 2 MHz span, 1024 point FFT). 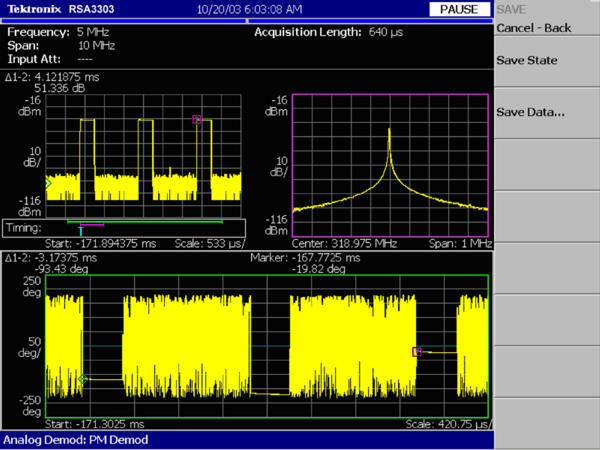 Remote Measurement Rate and GPIB Transfer rate - 7000 Samples/s at 2 MHz span Auto RBW Spectrum data. Ethernet Transfer Rate - 2.6 Mb/s (256 Mb .IQT file transfer). Displays - Up to 3 time-correlated, user-selected displays from the following: Spectrum, Spectrogram, Amplitude vs. Time, Frequency vs. Time, Phase vs. Time, IQ vs. Time. Preamp Power Connector - RSA2203A and RSA2208A: LEMO 6 pin connector - Pin 1: NC; Pin 2: ID1; Pin 3: ID2; Pin 4: –12 V; Pin 5: GND; Pin 6: +12V. LAN Interface (Ethernet) - 10/100 Base-T (standard). Minimum Input Level - –40 dBfs*1, typical. Accuracy - ± 1% of span (Signal at center screen, input level –10 dBfs). Accuracy - ±2 % (Signal at center screen, input level –10 dBfs, 10 % to 60 % modulation depth). Minimum Input Level - –40 dBfs, typical. Accuracy - ±3°, (Signal at center screen, input level –10 dBfs). *1 dB relative to full screen reference. Data Storage - Internal HDD (20 GB), USB port, Floppy Disk drive.